No Farms, No Food® Rally 2012: Better than Ever! Farm and food advocates from around New York State laid solid groundwork for legislative funding to protect farmland, and sustain the business of agriculture, at American Farmland Trust’s third annual No Farms, No Food® Rally, held February 15 in Albany. Key state leaders underscored their commitment to strengthening New York’s farm and food policy. Lieutenant Governor Robert Duffy, along with state agriculture committee chairs Senator Patty Ritchie and Assemblyman Bill Magee, joined us at the Rally and spoke in support of our pro-farm agenda. Duffy was emphatic about Governor Cuomo’s support for agriculture. “He gets it, he understands, he listens,” said Duffy. The Lieutenant Governor also spoke of his own personal interest in visiting farms and talking directly with American Farmland Trust, farmers and other supporters of New York’s farm and food systems, and about ways the state can help farmers build our farm and food economy. Senator Patty Ritchie, Chair of the Senate Agriculture Committee, told an enthusiastic crowd that “eating local matters.” Ritchie represents one of the largest-dairy producing regions in the state. It includes Oswego and Jefferson Counties, as well as the western half of St. Lawrence County. Ritchie is working with the state Office of General Services and Governor Cuomo to look for ways to bring more New York-produced food to Albany. It is imperative that the voices of pro-farming, pro-farmland advocates ring throughout Albany in the days immediately ahead, as New York State leaders negotiate a budget and review pieces of legislation key to farming’s future. Visit our website, to see great photos and media stories about the No Farms, No Food® Rally 2012. We encourage you to share the images and articles on your own websites and through social media to help spread the No Farms, No Food® message! The deadline for a final state budget is March 30, though Governor Cuomo is shooting to have it completed even sooner. Be sure to sign up for our email updates, if you haven’t already, and we’ll keep you updated during budget negotiations and as legislation we support makes its way through the legislature. Last but certainly not least, remember that developing relationships with your elected leaders is critical! Invite them to your farmers market, CSA or land trust event. Ask them to meet your town board or food co-op or take a tour of your community. They must not ever forget—No Farms, No Food®! This entry was posted in Farmland Protection, Local Farms and Food, New York and tagged conservation, environment, farm policy, Farmland Protection, local food, New York, No Farms No Food on March 17, 2012 by David Haight. At year’s end, we often reflect on the many challenges and successes of the past year. In New York, we are thankful for the tremendous impact that farmers, citizens and others have made to support local farming and the production of local food. Roughly 30 percent of New York’s farmers are over the age of 65—with five times more farmers over the age of 65 than under 35. The transition of farms from one generation to the next—if all doesn’t go smoothly—represents a time of risk when farms are susceptible to being paved over for development. But that period of transition also offers hope for a younger generation looking to farm. In November and December, we focused a spotlight on these issues with forums in the Hudson Valley and Western New York. These events brought together farmers, land trusts, agricultural educators and others to identify the greatest needs and opportunities for aiding senior generations with farm transfer planning and assisting younger generations with securing productive farmland. We organized our second No Farms No Food® Rally at the State Capitol on March 30, bringing together more than 150 New Yorkers and 70 organizations. Together, we met with more than 100 state legislators in support of critical funding needed to protect farmland from development, create farm and food jobs and increase the availability of local foods for all New Yorkers. With this support, Governor Cuomo and state legislators passed the first budget increase for farmland protection in three years and restored funding for a series of farm programs that were on the verge of being eliminated. 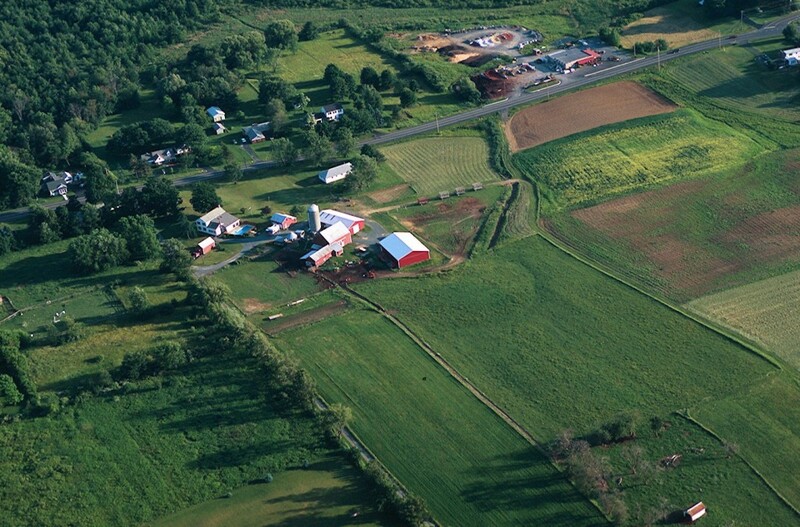 In 2011, we released Planning for Agriculture in New York: A Toolkit for Towns and Counties to help planners, citizens and local officials take proactive steps to keep farms thriving in their communities. The new guide highlights 80 communities that have taken action through agricultural economic development programs, food and public policies, zoning and land use planning, purchase of development rights, public education and more. After releasing the new guide, we held a six-session webinar series highlighting chapters of the new publication that attracted almost 300 people from New York and other states. For more than two decades, American Farmland Trust has worked with farmers to continue their legacy of environmental stewardship in New York. In 2011, we worked with farmers, landowners, conservation professionals and others to develop the Owasco Lake Agricultural Conservation Blueprint to help farmers enhance water quality in the lake while ensuring thriving farms. In addition, we kicked off a significant project in partnership with Cornell Cooperative Extension of Suffolk County that will help sweet corn growers alter their fertilizer practices in order to reduce pollution in Long Island Sound. This entry was posted in Local Farms and Food, New York, Water Quality and tagged BMP Challenge, Farmland Protection, local food, No Farms No Food, Water Quality on December 8, 2011 by David Haight. Farmers are some of our nation’s greatest environmental stewards. This notion is exemplified in New York State, where farmers are part of a globally significant effort to provide clean, unfiltered drinking water to more than nine million residents of New York City. This success story is providing incredibly clean water to millions of people and saving city residents billions of dollars annually by avoiding the costs of constructing and operating water treatment facilities. Success in the New York City Watershed is due in part to farmers protecting their land and managing it as a natural water filter in the watersheds surrounding the city’s reservoir system. Critical to the environmental health of the New York City watershed is the millions of dollars invested by New York City in farms. These investments have permanently protected more than 15,000 acres from development and put in place stream buffers and other conservation practices on thousands more. 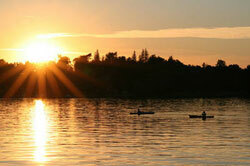 Such public investments are important to solving water quality problems. But while protecting the environment can be an additional cost to farm families, many farmers are not compensated for providing clean water, wildlife habitat and other environmental benefits enjoyed by the public. At a time of tight budgets at all levels of government, public funds that help farmers protect and steward their land are under threat of being cut severely or eliminated. How can the farm community be a part of solving water quality challenges at a time of such uncertainty about farm profitability and public conservation dollars? This is exactly the type of question that we seek to answer for the Owasco Lake Watershed, one of New York’s Finger Lakes. 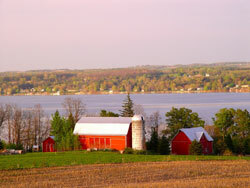 Owasco Lake serves as a filtered drinking water source for approximately 55,000 people. Roughly 55 percent of the watershed surrounding the lake is in agricultural use and Owasco Lake has historically been one of several Finger Lakes with water quality problems. Some of the water quality concerns are due to run-off entering the lake from agriculture, but that is not the only source of pollution. Other activities of concern include the over-fertilization of lawns along the lake shore and tributaries, poorly functioning septic systems, improper disposal of yard waste and the overwintering and nesting of waterfowl. Recommendations to address these four challenges are focused on Owasco Lake but can provide lessons for the rest of New York where farmers are major players in the landscape. Looking forward, our efforts to engage farmers in protecting drinking water will require us to overcome boundaries between agencies and coordinating efforts while providing farmers with timely solutions to the full range of conservation challenges they are facing. Funds from conservation programs will continue to be important, and we will be challenged to ensure they’re used in a way that maximizes the benefits to farmers and the general public. Swift action is also needed to stop the continued loss of farmland from sprawling development, which has plagued New York’s rural landscape for decades. The quest for cleaner water will continue to challenge the farm community and the many agencies and organizations working with them. But ultimately, it will challenge all of us to ensure both a healthy environment and a strong farm economy. This entry was posted in Agriculture and Environment, Conservation, Farmland Protection, Local Farms and Food, New York, Water Quality and tagged conservation, Finger Lakes, Owasco Lake, Water Quality on June 24, 2011 by David Haight. National attention to concerns about food security, access to locally grown foods, and public health issues has never been higher and this focus is bringing together a diverse group of supporters with a shared energy to protect our farms and food. Farmers, ranchers, chefs, soup kitchen volunteers, environmentalists, urban gardeners, town officials, and local food advocates are agreeing on one thing: we must have local farms if we want to have local food. Farms also remain critical to our economy. In New York, the state’s 30,000 farms sell more than $4.5 billion annually –milk, fruits, vegetables, meat, flowers, plants and so much more. 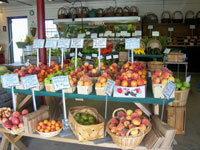 Also, farms buy much of the goods and services they need to survive from other local businesses. Frequently overlooked is the network of connections between farms and thousands of New Yorkers employed at hardware stores, banks, farm equipment dealers and other enterprises that support local farms and food. When you add together the businesses that sell goods and services to farmers, farm jobs and food processing companies, these enterprises generate a combined $30 billion a year in economic activity in just New York. With New York City residents alone spending more than $30 billion a year on food, the potential remains for growth in businesses involved in and connected to agriculture in the state. This economic growth, however, is dependent on the viability of our working lands. Tragically, the United States continues to lose its valuable farmland to subdivisions, strip malls and other scattered development. Between 1982 and 2007 the nation lost more than 23,000,000 acres of farmland, an area the size of Indiana. In New York, we have decided to channel the energy surrounding farm and food and work collectively to bring these issues to our state legislators. People from across the state will be converging at the Capitol in Albany for our annual No Farms No Food® Rally and Lobby Day on March 30. Together, we will tell our elected officials that they must take action to stem the loss of farms that threatens our economy and food security. The No Farms No Food® Rally and Lobby Day is in response to the urgent situation we face. New York’s remaining farmland is capable of feeding only 6 million of the state’s population of 19 million—that’s just 30 percent. 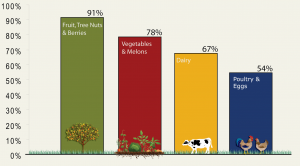 What’s more, nationally, 91 percent of our fruits, nuts and berries, and 78 percent of our vegetables and melons are produced on land immediately outside of our cities—the very regions in the most danger of being consumed by urban sprawl. We simply can’t afford to lose another acre of farmland in this country. Get involved and make a difference! If you live in New York, attend our No Farms No Food® Rally and Lobby Day. In any state, share your concern about farmland loss by contacting your federal, state and local officials and make sure they know you support local agriculture and want farmland protected. This entry was posted in Farmland Protection, Local Farms and Food, New York and tagged Farmland Protection, New York, No Farms No Food on February 18, 2011 by David Haight. 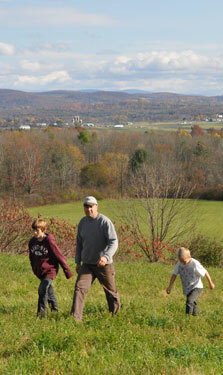 New York State is losing farmland fast. The state has lost almost half a million acres of farmland to subdivisions, strip malls and scattered development in the last 25 years. In addition, New York’s remaining active agricultural land is capable of feeding only 6 million of the state’s 19 million residents. That’s only 30 percent of the state’s population! Our food security and economy are hurt as the state continues to lose farmland at a rate of 9,000 acres a year—the equivalent of one farm every 3 ½ days. Rural communities in western and central New York along with the North Country have seen an influx of commuters from upstate cities and second home owners. Meanwhile, the Hudson Valley and Long Island continue to experience some of the most intense development pressure in the nation. Some of these impacts are glaring. Farm fields have been paved over with subdivisions, shopping plazas and parking lots. Other significant effects of poorly planned development are less visible. Farmland prices in many regions have risen to levels farmers can’t afford. Demand for public services goes up and as a result property taxes are rising. Nevertheless, a growing number of New York communities are rediscovering something that used to be common sense: Communities need local farms. Farms provide food and jobs. Farms protect water quality. Farms maintain scenic landscapes and wildlife habitat that not only attract tourist dollars but are integral to the quality of life of local people. Our newly updated publication, Planning for Agriculture in New York: A Toolkit for Towns and Counties, gives farmers, local governments and communities the information they need to work together to put the brakes on poorly planned development and keep farmers farming. This new resource profiles more than 80 case studies of towns and counties in New York and other states across America that have taken action to strengthen economic opportunities for local farmers and protect farmland from being lost to development. It describes 12 tools—from agricultural economic development programs, food procurement and health policies, zoning and purchase of development rights, right-to-farm laws and public education programs—that can be used by local governments to support the business of agriculture in their community. Although focused on New York, the toolkit and accompanying appendix offer useful lessons about the programs and policies necessary for successful planning for agriculture in any community. The guide also provides information on how to educate others on the value of our farms and farmland. In the end, our hope is that this new toolkit supports efforts to protect our agricultural land in New York and beyond. This entry was posted in Farmland Protection, New York and tagged Farmland Protection, New York, Planning for Agirculture, purchase of development rights, zoning on February 3, 2011 by David Haight. The Environmental Protection Fund (EPF) is New York’s primary source of dedicated environmental funding and helps protect the state’s working farms, water, air and environmental and public health. The Farmland Protection Program, a part of the EPF, funds the permanent protection of working farms and the development of town and county agriculture and farmland protection plans. A recent 11th hour shake up between Governor Paterson and the Legislature has left funding for the state Farmland Protection Fund cut by $11.25 million (51%) and the EPF reduced by 37 percent. In a last minute deal to reopen 55 state parks in time for Memorial Day, the Governor and Legislature agreed to pass a greatly reduced budget for the 2010-2011 EPF. The negotiated $78 million cut to the EPF resulted in the state’s release of $11 million to reopen the closed parks. The negotiation occurred outside of the normal budget process and was not subject to any public conference committees. These cuts will have a severe impact on the Farmland Protection Program, which now has a backlog of more than $70 million of committed projects. As money continues to be “borrowed” from the EPF to pay for non-environmental purposes, many environmental protection projects across the board are left unfunded, straining organizations, municipalities and others partnering with the state on environmental programs. On a more positive note, our endangered state parks-vital to New Yorkers who rely on their economic activity and connection to nature-have reopened. Another important victory for New Yorkers was the Legislature’s rejection of “offloads” to the EPF proposed by the Governor to pay for unassociated state agency operations and tax payments. Unfortunately, these are not enough. If we truly want to protect the clean air, water, natural areas, and working farms that benefit all New Yorkers, then there must be a repayment plan for the EPF and Farmland Protection Program– no exceptions. We must also put an end to the raiding of these funds by our elected officials for non-environmental purposes. And finally, we must get the budget passed! There are many food and farm programs outside of the EPF whose budgets have not yet been decided. As a result, vital programs like the New York Farm Viability Institute have suspended projects that help farmers develop new markets and more closely connect with consumers. Every day we are urging legislators to reconsider cuts in EPF and Farmland Protection Program funding and advocating for a plan to repay the nearly half a billion dollars that has been swept from the EPF over the past several years for non-environmental purposes. Please help us by telling your state legislators to restore funding for farm, food and farmland programs. Together we can secure greater funding and ensure a better future for New York’s working farms, water, air and environmental and public health. Thanks! About the Author: David Haight is New York Director of American Farmland Trust. This entry was posted in Farmland Protection, New York, States and tagged Budget Cuts, Farmland Protection Program, Governor Patterson, New York on June 8, 2010 by David Haight.